A beginner swing lesson will be given at 7:30PM to get you on the floor. At 8pm, Gail Storm Blues Band will be playing some of their great swing dance tunes. 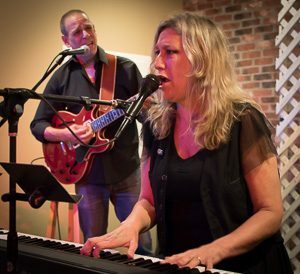 Boogie woogie traditional blues, swingin’ classic jazz standars, ballads and more; The Gail Storm Band does it all with Storm on keyboards and vocals and her phenomenal sidemen-and women! Gail is a true performer as she reinterprets the classics and delivers the message directly to your dancing feet. A few ballroom dances will be in the mix as well. The recently renovated Moose Lodge has a fabulous, huge 1000-square-foot dance floor, freshly painted walls, new ceiling, new lighting and plenty of tables to relax and chat.